Yes sadly it seems many people’s dreams of a peaceful co-operation between Russia, the US and Syria just went up in flames. Donald Trump like the immediate US Presidents before him is apparently desperate to start a war after all. 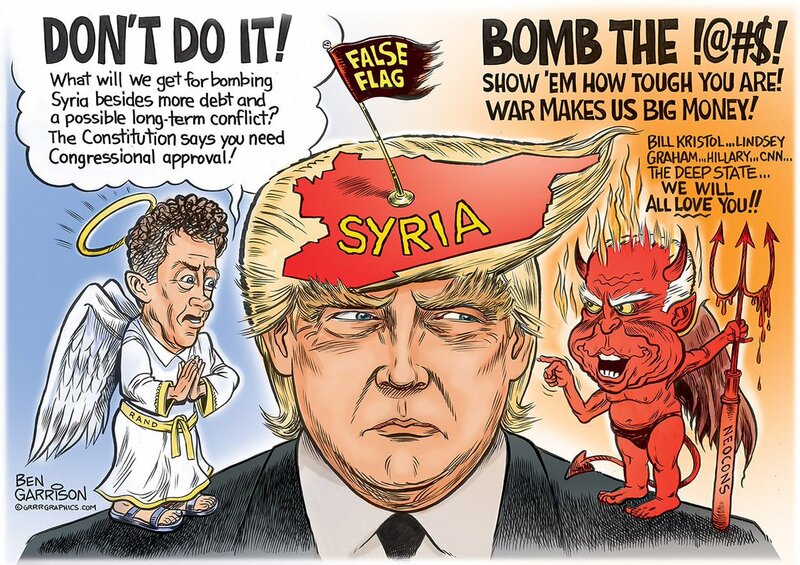 Naturally many of Trump’s supporters such as Paul Joseph Watson who only supported him due to his anti war stance, and his desire to limit American intervention in the middle east have now turned on him. Whilst some people have criticised Watson and others such as Lauren Southern for apparently “flip flopping” on Trump personally I admire them for sticking to their principles. They only supported Trump because they believed he was a better option than Hillary Clinton in terms of foreign policy. Now that Trump is seemingly pursuing the same destructive foreign policies that Hillary wanted in toppling Assad then they are calling him out on it. I will say there has already been a lot more criticism from Trump’s high profile supporters for his actions in Syria than there were from Obama’s for his many war crimes. Trump’s Syrian strike not only classes him as a war criminal, but also reveals him to be a spineless, weak man who is easily manipulated by those around him into changing his position in the blink of an eye. Courtesy of Ben Garrison cartoons. Abby Martin, former host of Breaking the Set actually warned of this many months ago saying that she felt Trump’s biggest problem was the way he was too easily influenced and prone to changing his mind all the time. See here in this video. Trumps actions in Syria could very well lead us into a full scale conflict with Russia. It remains to be seen if Russia and America can smooth things over, but still he is taking a huge risk over what is ultimately a pointless endeavour. To start with it is not known yet if Assad was even guilty of the recent chemical attack. I am not saying that he wasn’t, but its certainly not proven and in some ways it doesn’t make sense for Assad at this stage to gas his own people when things are generally heading in his favour. ISIS and Al Qaeda were both in retreat, peace talks were going ahead and at that point Trump was limiting intervention in the middle east. For him to suddenly blow that does seem a little unlikely, though again we still don’t know for sure. Personally I think that this smells of another Saddam has weapons of mass destruction, Benghazi debacle, a lie cooked up to goad us into being ready for a pointless and bloody conflict. Whatever the case even if Assad does turn out to be guilty then removing him is still the worst of all options. To start with it risks a war with Russia which could in turn escalate into a Third World War! Remember Syria is close allies with Russia, who in turn are close allies with Iran and China. The end result of Trump poking and prodding Syria and Russia could see the US, the UN, Russia, Iran and China all aiming nukes at each other. Russia is also no lame duck either. It has weapons capable of destroying an area the size of Texas. Russia has already tore up a 2015 military operations agreement it had with the US, which gives both sides open communication regarding air operations. There is now a much greater risk of American and Russian jets accidentally shooting each other down! Even if there somehow isn’t a war between Russia and America then removing Assad will make things worse for Syria. It will completely destablise the country just like Iraq and Libya and shatter it into a thousand pieces leading to more deaths, and another refugee crisis. It will also give ISIS a footing and lead to a greater rise in Islamic extremism (the very thing Trump promised to fight). Ironically these are all the things that people (myself included) were terrified Hillary Clinton would cause if she got in. To be fair I do still think that Hillary would have caused a conflict with Syria and Russia if she had been elected President. Just last night Hillary Clinton said she wanted the US to launch an attack against Syria and for Putin to be held accountable for his actions. See here Clinton calls for Bombing Assad’s Air Fields. So its not a question of “if only Hillary had won” its more that sadly Trump was no alternative after all. No matter who the Americans voted for it seems war was inevitable. It funny in a tragic way how Obama and Trump really are no different after all. When Barack Obama was voted in in 2008, people hoped that he would be a positive change and end the conflict in Iraq and limit American intervention in the middle east. Just like Trump he promised to do that and the two candidates he was up against, John McCain in 2008 and Mit Romney in 2012 were also both crooked war mongers. Thus Obama at the very least was seen as the lesser of two evils. Obama however ended up not only increasing the use of drone strikes significantly from George W Bush, but he too destroyed an entire country, Libya, in an illegal invasion. Flash forward to 2016 and many people myself included hoped that Trump would be a positive change in terms of foreign policy and limit American intervention in the middle east as he promised to improve relations with Russia and leave Assad alone. He also went up against a candidate who was a crooked war monger, Hillary Clinton too. However barely 3 months into his Presidency Trump has already carried out a war crime and an illegal attack on another sovereign state. If you weren’t duped by Obama in 2008 being a positive change then you were probably duped by Trump supposedly draining the swamp in 2016. It seems there is no escape. Its always the same war mongers running things from behind the scenes, using a spineless puppet as their front man. You can vote Democrat or Republican, Trump or Clinton, Obama or McCain and the result is the same. More wars. Its time in my opinion that the left abandoned identity politics once and for all. Rather than constantly fight each other over trivial stupid things like gender pronouns, white male privilege etc. The left seriously needs to get its arse in gear and try and find a way to reform the current corporatist system that favours endless wars and expansion.